The following are detailed specifications about the Tech Lighting Satin Nickel Modern Flushmount Light. This flushmount ceiling light from Tech Lighting has a clean, contemporary profile that flatters any room in your home. 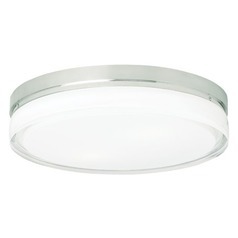 The satin-nickel finish on the ceiling baseplate and complementary clear glass drum shade are ruggedly constructed for reliability and durability. Two rigid-loop-base incandescent G9 light bulbs are included with this fixture and provide efficient, easy-on-the-eyes illumination over a kitchen sink or in a laundry area. Alternately, this low-key fixture from the Cirque Ceiling collection is ideal in a mudroom entrance, over a garage workbench or in a dim center hallway. 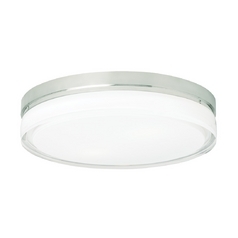 This Tech Lighting Satin Nickel Modern Flushmount Light is part of the Cirque Ceiling Collection from Tech Lighting. The following items are also part of the Cirque Ceiling Collection.